This past weekend, shortly after erecting and tuning the new multi-band inverted vee, it rained. A lot. Rain affects antennas, sometimes in surprising ways. I'll discuss that and a few more details about the construction of this antenna. Most antennas don't show much change when it rains. The effects are small enough to escape notice or, if noticed, are not of much concern. Careless design can amplify the effects of rain, resulting in performance problems. The latter is true of my inverted vee. To understand what can occur we need to talk about velocity factor (VF). That is, the velocity of electromagnetic (EM) radiation is less than c (the speed of light) in any medium other than a vacuum. This matters since the propagation of EM along a conductor is partly in the field surrounding the conductor rather than fully within the conductor. The VF of air is close enough to 1 that in ham-related applications its effect can be ignored. In coaxial transmission lines the dielectric material filling the space between conductors determines the VF. The fields associated with RF current in both inner and outer conductors is within that material. For example, the most common material, solid polyethylene, causes a VF of about 0.66. That must be accounted for when constructing coaxial transformers. The same effect occurs with typical commercial ladder line since the wires are encased in plastic and are held apart with plastic spacers. The VF is higher than in coax (in the range of 0.95 to 0.98) since most of the fields travel in air, not plastic. Antenna wires work the same way. That is why antennas made of insulated wire must be made shorter by ~1% to 3% than indicated by standard length formulas. EZNEC makes this easy to include in models and I always do so for wire antennas I plan to construct. When it rains there will be some water clinging to the antenna. The EM fields must travel through this water. Therefore when it rains the antenna becomes electrically longer. This is true whether the antenna is made of bare metal or insulated. In most cases the effect is small and can be ignored. Snow has a lesser effect but stays longer. Freezing rain can have effects on antenna resonance of several percent. However, we are usually more concerned with the antenna staying up and in one piece in this last instance. That tends to distract our attention from high SWR and other performance impacts. If you live in a climate similar to Ottawa where freezing rain is common you'll likely already know what I'm talking about. In my case the rain caused none of the above effects to any significant degree. It did however cause a major resonance impact on every band. While I did not take the trouble to measure and test, I know what the rain did, and indeed I knew before I raised the antenna. It has to do with wire termination. Any good antenna book recommends high-quality terminations for wire antennas. A ceramic insulator is best. The ends of antennas are high-impedance (low current, high voltage) points, and are prone to coupling with other conductors in the vicinity. The problem is worse with wires than tubes. With high power, a pointy wire and low humidity you can even get corona discharges to the air itself. I did not use high-quality terminations for the parallel inverted vee antenna. I would need 8 of them which I did not have and, importantly, would add undesirable weight (and sag). Instead I created end loops out of the wires themselves by tying the bare end back on to the wire. These loops partly compensate for the wire's narrow diameter (lower the terminal impedance). However the problem lay elsewhere: in the nylon ropes. Ropes contain a lot of air space between the strands. When it rains water fills those spaces. Synthetics such as the nylon rope I used shed water more readily than natural fibres. But that only comes into play after the rain stops, with the nylon drying faster than natural fibre rope. While fresh water is not a great conductor, electrolytes are usually present from collected debris. The high voltage at the ends of the wires amplifies the coupling. The result in my case is that in the rain the antenna's resonant frequency drops quite a lot on all bands. It averages about 200 kHz. Since my antennas are tuned to favour CW band segments this raised the SWR on much of the phone segments, sometimes well above 3. Since I primarily operate CW this didn't slow me down, at least not after the initial surprise. Some loss due to coupling to the wet rope is also to be expected. The pattern of a dipole or inverted vee is not appreciably affected by rain, just the resonance and impedance. 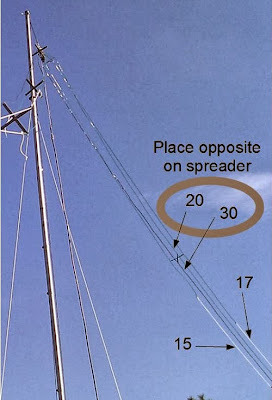 If you are using a wire array such as a yagi the pattern will be highly distorted. Not only is the driven element affected, so are the parasitic elements. Drop the resonant frequency of a director or reflector by 200 kHz and your front-to-back may entirely vanish. Gain will also drop, though by a smaller factor. As an example of this effect I've included here the azimuth patterns of a 3-element NBS yagi for 20 meters in free space. One at resonance on 14.150 MHz and one when resonance is lowered by 200 kHz. The latter is simulated by setting the test frequency to 14.350 MHz. While not shown here, the SWR would also rise sharply since the radiation resistance is 2x higher and there is substantial reactance. As a general rule the tolerances of multi-element arrays are always tighter than in any single element antenna. For this reason I always used ceramic insulators on the wire yagis I built in the past. The second and last point about the multi-band inverted vee I want to mention is the arrangement of the wires and spreaders. Recall that there are 4 inverted vees in the shape of a virtual cylinder, cut for 30, 20, 17 and 15 meters. The outermost spreader is placed just inside the termination of the 20 meters antenna. That spreader (and its mate on the other side of the antenna) support wires for 20 and 30 meters, and the ropes coming from the ends of the 17 and 15 meters antennas. To assure the stability of this spreader it is important that the wires for the two lowest bands be positioned opposite each other. 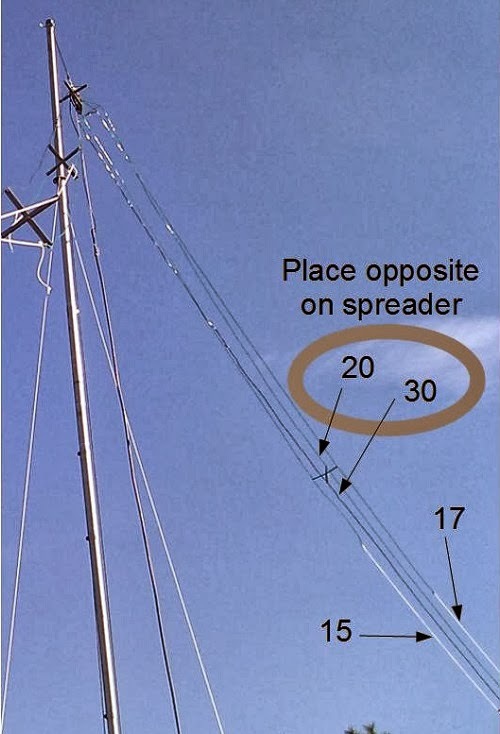 Since the nylon ropes run nearly frictionless through the spreader notches (necessary for tension adjustment) the spreader would tip over if those wires were adjacent rather than opposite. The same reason dictates positioning the spreader inside the termination loop of the 20 meters antenna.